Honesty, Reliability, and Compassion. We proudly serve Southern WisconsinVandergals understands the unique needs of those who are in the process of settling an estate, downsizing, or moving. Our pledge to you is a professional company that strives on honesty and reliability. Vandergals assures compassion and kindness for the families, along with utmost respect for the property involved.We are proud to offer: Complete in home sales and complete/partial buy outs. Contact us today to schedule a FREE consultation!Vandergals will NEVER charge any money upfront! No hidden administration, advertising, or any other fees! Never have - Never will!! *** UPDATED *** PRIMO Estate Sale PACKED FULL of Primitives, Antiques, Vintage, & Retro treasures! Vandergals Estate Sale - 3 Day Extravaganza THE HOUSE IS PACKED FULL!! Vandergals Proudly Presents An Amazing Collectors Estate Sale! UNIQUE TREASURES!! ANTIQUE STORE CLOSING SALE - EVERYTHING DOWN TO THE BARE WALLS MUST GO!! Extraordinary Estate Featuring Art, Mid-Century pieces,Outstanding Oriental Pieces, & BRAND NEW ITEMS! Vandergals Are Proud To Present This Gem Of A Sale! Marvelous Oconomowoc Estate Sale! Jewelry, Native American Rugs, Antique Medical Supplies, Pottery & MORE! Estate Sale Extravaganza - A THREE DAY SALE YOU DON'T WANT TO MISS!! Splendid Estate Brimming With Lustrous Jewelry and Stunning Decor! Vandergals Estate Sales Is Proud To Present A Watertown Classic! Beaver Dam Estate Sale ~ Jewelry, Antiques, Mid Century, FUN SALE - THE HOUSE IS PACKED FULL! SMALL BUSINESS SATURDAY AT VANDERGALS! shop small!!!!! IMPRESSIVE ESTATE SALE - So Many Unique Items!!! One Of The FINEST Estate Sales Around! 103 Years Of Treasures - A Sale You Don't Want To Miss! Charming Estate Sale That Has A Little Of Everything! Complete Closing Of A Charming Upscale Estate!!! Living Estate Auction - 5 Generations! COLLECTORS WONDERLAND - MASSIVE ESTATE SALE! Charming Estate With Many Unique Treasures! Affluent Estate That WIll Take Your Breath Away - Once In A Lifetime Offerings!! An Eclectic Estate Filled With Antiques, Mid Century Furniture, and Victorian Treasures!! Wonderful Estate Sale - 94 Years Of Treasures!! Vandergals are excited to have received a complete 10 star rating on an estate buy-out with the following comments. " I can't say thank you enough. I appreciate your thoughtfulness SO much! You helped me get this done during a very difficult time. What a great service you can offer! I would give your business cards to others!!" Vandergals is honored to have received a complete 10 star rating from their client with the following statement. "Thank you so much for everything you did for us at a difficult time. We especially appreciated how you took care of everything while we were gone and how you communicated with us. It was a pleasure working with you both." 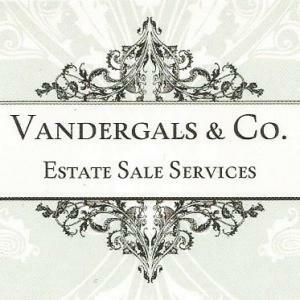 Vandergals is elated to have received a complete 10+ star rating from their client with the following comments, "Vandergals did a fantastic job regarding my estate sale. The ladies were knowledgeable, friendly, and top notch professionals; going over and above what I could ever expected!! I was so comfortable knowing they had my best interest and that I could trust them to handle my entire estate/belongings. I would highly recommend their services to anyone and everyone - and already have!! Thank you Laura & Wendy - you ladies have been a true God send and feel like I've made some new friends! You took the stress out of an overwhelming task for me; made it fun & were so successful!!" Vandergals proudly received a complete 10 star rating from their client with the following comments.